There is a tremendous push towards circular economy in today's world. Materials need to be regenerated and constantly flowing through a Closed Loop Systems rather than being used once and then discarded. Arch is constantly looking at ways to embed cyclic thinking into our innovation process, focusing on unlocking new customer offerings by completely re-thinking the way we design and manufacture products. The potential benefits to companies by this approach are clear both from business - like building Brand Equity and obviously environment protection. It means new sources of value of companies, better risk management of raw material and improved approaches to the supply chain. Many Food and Beverage companies are following this approach and thinking about using recycled materials in their packaging. Recycling reduces the amount of plastic sent to landfills and using recycled PET means less petroleum is needed to make new resin. 91.6 Less energy is used to produce PCR resin as compared to energy used to produce virgin resin. Based on survey of Information Resources Inc. 89% of consumers are interested in ecofriendly products and 30% are actively looking for them. More than 75% of US adults show some kind of green motivation. Natural Marketing Institute says that such a percentage makes sustainability a more attractive and imperative option for business to engage consumers. 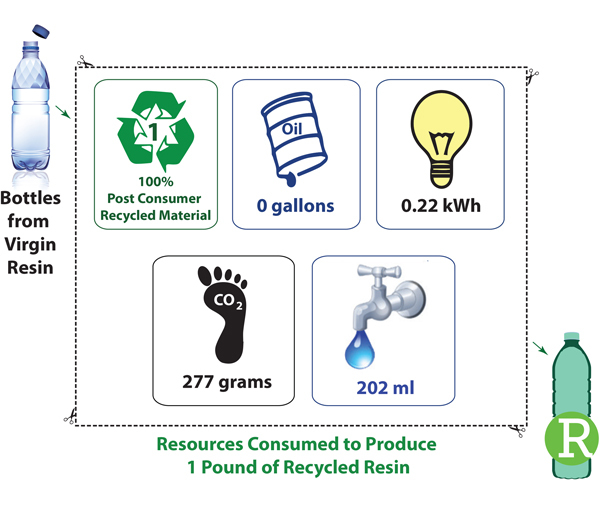 78% Less Greenhouse gases as compared to virgin resin. Recycling plastics creates 6 times more jobs than landfilling recyclables and 36 times more jobs than incinerating them. Various kinds of PCR resins are available which are fragrance free, FDA approved, and there is no projected shortage of Post-Consumer Recycled resins. PCR resins that Arch has qualified have a no objection letter (LNO) confirming the capability of the proposed secondary recycling process which is Super Clean to produce post-consumer recycled resins. Here at Arch Plastics Packaging, PCR resins are qualified and rigorous testing is performed for produced bottles. Arch has the capability to blend at various levels of PCR content up to 100% PCR. Arch Plastics qualified PET-PCR resins have lower acetaldehyde levels and can be available with wide variety of IV or molecular weight to suit a versatile area of applications.